Bungalows, like this one in Berwyn, could provide Effortless Energy with a replicable model for cost-effective energy efficiency retrofits. 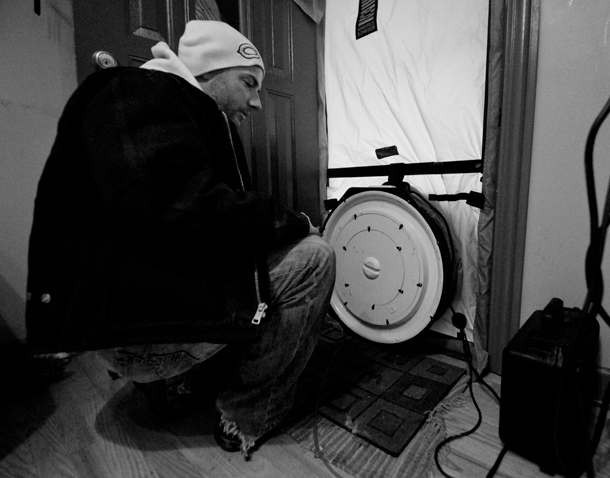 A contractor with Building Energy Experts conducts a blower door test to assess an Avondale home's leakiness. In the age of big data, it pays — or, in this case, saves — to put your nerdiest foot forward. “I swim in this stuff,” he says, mocking up a probability distribution on a whiteboard in the company’s offices in Merchandise Mart tech incubator 1871. Gee, a third-year PhD student studying computational public policy at the University of Chicago, started the business in 2012 with a fellow University of Chicago student, Claire Tramm. They want to be a one-stop shop for residential energy efficiency retrofits. Simple upgrades like air sealing can save American homeowners energy and money — sometimes as much as 50 percent on their energy bills. For low-income residents, who typically pay between one quarter and one third of their income in energy costs, the savings can be powerful. Cumulatively these retrofits could make a serious dent in our carbon footprint; the U.S. residential sector is nearly as large a source of carbon emissions as transportation. Gee and Tramm think they have an answer for the question that dogs every energy saver who sings the praises of efficiency: If it’s so good, why isn’t everyone doing it? For many families, it can be difficult to finance an effective retrofit. And in a highly technical market, good information tends to be in even shorter supply. Like Illinois’ own stimulus-funded energy efficiency program, Effortless Energy fills in that gap. Their product is called a Home Energy Efficiency Service Agreement, and it works like this: The company pays for its customers’ energy audits and certain retrofits, sharing in the energy savings until the investment pays for itself. The customer pays less, even after its monthly installments to Effortless Energy. If Illinois were to adopt an on-bill repayment policy like the one California has, it could streamline this process by combining the two bills. The default rate for utility bills is under 2 percent, lower than for credit cards or mortgages. Gee said the company estimates 8-9 out of 10 customers will pay back the loans in full. And they are careful about which homes they target. 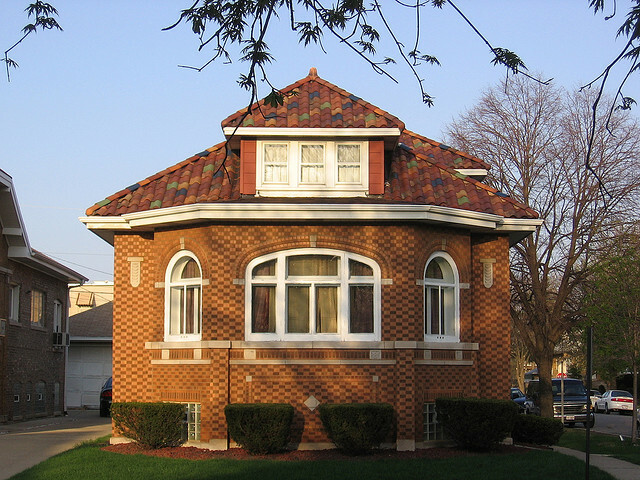 Roughly 60 percent of Chicago’s housing stock is bungalows. A partnership with DNR Construction, which is well-versed in bungalow renovation, could help them tap into a $230 billion U.S. market, Gee said. Their proprietary algorithm shares DNA with the code that powers investment banking, but Gee likens it more to retirement savings — they’re in it for the long haul, he says. It works by quantifying the variance in a slew of home energy efficiency metrics, such as a building’s insulation value and draftiness, and optimizes for the best returns. That means they know with what level of certainty any given improvement, such as installing a new heating and ventilation system, will return a certain amount of savings each year. “We’re viewing each home as part of an investment portfolio,” Gee said. Their system works best in homes with smart meters, thanks to those digital device’s more robust data. Typically energy audits result in a hard-line recommendation: Install a new heating system and save $1,000 per year, for example. But for many customers, Gee said, that implied certainty is hard to believe. Instead Effortless Energy projects a range of savings. Gee’s PhD research uses computational modeling to analyze energy use and consumer behavior, anticipating a day when an integrated smart grid would use big data to optimize energy efficiency nationwide. Wells Fargo no longer offers its energy efficient mortgages, and "Property Assessed Clean Energy" loans have met the same fate. With traditional catalysts for energy efficiency retrofits on the outs, Effortless Energy hopes to gain a foothold in a massive, still largely untapped market. They have done 7 or 8 home tests validating their model, and will soon begin a pilot program on 20 homes in Oak Park, opting for the West Side suburb because of its renewable power bonafides. Oak Park became the first municipality in the state to pursue an "all-green" power program that favors wind and solar power, and purchases credits to offset any nonrenewable sources. Gee may bill himself as Chief Nerd, but he knows it isn’t numbers that ultimately close deals. Energy efficiency, he says, has an emotional appeal: it could save money and energy, but when it saves you from reaching for a winter blanket, the investment has paid off.